The Process of making a sterling silver charm starts with an original model, which is made by hand by a model maker. The model does not need to be made from precious metal but can be made from a cheap easily worked material such as copper. 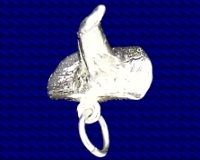 The Model maker uses saws, drills, files, and all the skilled techniques of the silversmith to make as accurate an image of the charm required as possible. A piece of wire is then soldered to the model, this is called a sprue, when a mould is made of the model the sprue will form a tube through which wax can be injected and later when the casting mould is made it will form the tube down which the molten metal will flow to make the casting. The model is then cleaned in acid and polished to a high finish,for any flaws in the model will be repeated in the finished charm. A mould must now be made from the original, this is made of rubber. A mould frame is half packed with unvulcanised rubber. The model is then placed on the rubber, with the sprue running to an edge. More rubber is now packed on top of the model and a metal plate is placed on top. Now the mould frame packed with un - vulcanised rubber is placed in a pre heated vulcanising press. The press is tightened and the heat and pressure melts the rubber ensuring it goes into every detail of the model. After the vulcanising process is complete, the hot mould is quenched in cold water and allowed to cool. It is now ready to be cut open, this is done with a surgical scalpel and requires considerable practice and care! When the mould has been cut open the model can be removed leaving a cavity which has all the detail of the original model. The mould is now ready for use. It is first dusted with talc or sprayed with a release agent, both ease the removal of the wax from the mould. The mould is placed between two metal plates, to keep it flat and to spread the pressure so that it is applied evenly. The hole left in the mould by the sprue is then pressed onto the valve of the wax injector, which injects hot wax under pressure into the mould. When the mould is opened a wax copy of the original model is found, it is then carefully removed ready for the next process. The mould will carry on producing wax copies many thousands of times if used carefully. A bar of wax is then inserted into a rubber base to form the trunk of the wax tree. The waxes made in the rubber moulds are then attached to the tree by melting the end of the sprue with a soldering iron. The completed tree is then ready to be encased in a type of plaster, called investment. A metal sleeve, can , is placed around the wax tree and located in the rubber base to make a water tight seal. The investment powder is mixed with water to make a smooth running paste, it is then put into a vacuum chamber to remove air bubbles and finally it is poured carefully into the can. The can is then put into the vacuum chamber to remove any air bubbles that might damage the quality of the final cast product. It is then left to solidify. When the investment in the can has set it is ready for the next process, burn out. The rubber base is removed and the can is put into a burnout furnace. The temperature is slowly raised to over 725degrees C, the slow increase in temperature allows most of the wax to run out of the can and through a drain in the bottom of the furnace,(any residue is burnt by the extreme heat),it also allows the investment to dry slowly , so avoiding cracks in the mould. Once the can has been heated for the correct length of time,the temperature is gradually reduced to the casting temperature of approx.585 degrees C.
When the casting temperature is reached the metal to be cast is put into the crucible of the centrifugal casting machine. It is then melted. The can is removed quickly from the furnace and placed in a cradle next to the crucible containing the melted metal, The metal arm holding the can and crucible is then released and spins at high speed throwing the molten metal into the mould. The hot can with the castings inside is left to cool to a black heat. It is then quenched in cold water, the shock of the hot investment meeting the cold water breaks the mould and allows the casting tree to be easily removed. The Sterling silver Charms are then snipped from the tree with a pair of cutters. As you can see the charms at this stage are black and rough and still need cleaning and polishing before they are ready for sale. First the sprue must be removed, it is clipped as close as possible to the charm and then what is left must be removed either by filing or using a small grinding point. The sterling silver charms are then soaked in acid to remove the black oxide stain and stamped with either a silver stamp or a 925 mark. Finally they are polished with either a vibratory or a rotating polishing machine which uses stainless steel shapes to burnish the charms. I hope you have found this explanation of the casting process interesting and now have an insight into the processes and techniques of the lost wax caster.